It’s exciting to be able to offload some day-to-day stresses by adding smart home products into your life, like doorbells that let you know who’s at the front door and security systems that automatically arm when you leave the house. Finding the systems and products that fit your lifestyle and your budget can make life a whole lot easier. Here are our top picks for the best smart home security systems to get you started, plus some pro tips to help you create your ideal smart home. 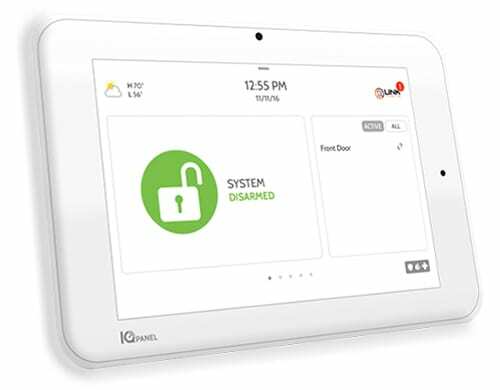 For professionally installed security systems, Vivint is our top pick for home automation. It made our list of The Best Home Security Systems of 2018, partially because of its smart home technology features. It offers a comprehensive lineup of home automation equipment, along with support, to help get you on your way to a fully automated home. 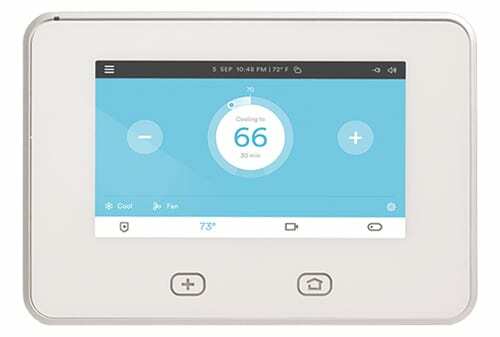 Vivint systems are professionally installed and monitored. You can select a package or you can go à la carte and just pick the equipment you want. Contract options are flexible too: you can choose a monitoring-only, month-to-month contract, or you can make a longer commitment with a four- to five-year contract that includes an equipment financing plan. The Ping countertop camera lets you talk with people in your home, even while you’re away. It’s a great option for families with young children or aging parents. 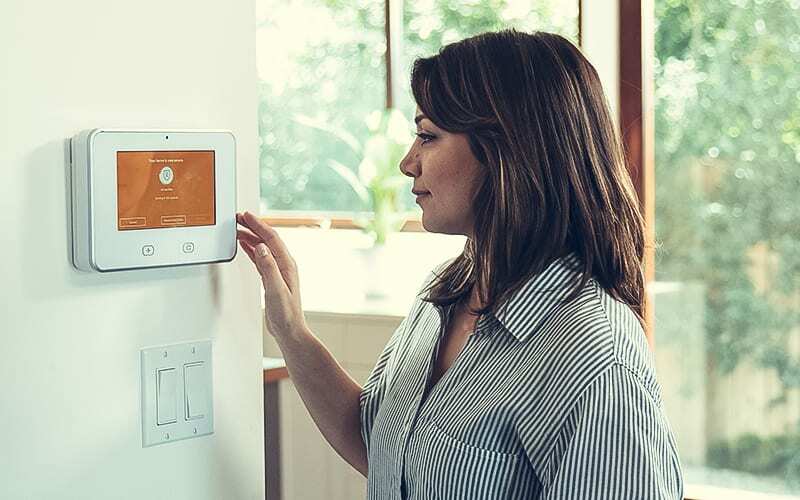 Vivint also offers a motion-sensitive doorbell camera and a touchscreen control panel with two-way voice that connects you directly to Vivint monitoring. 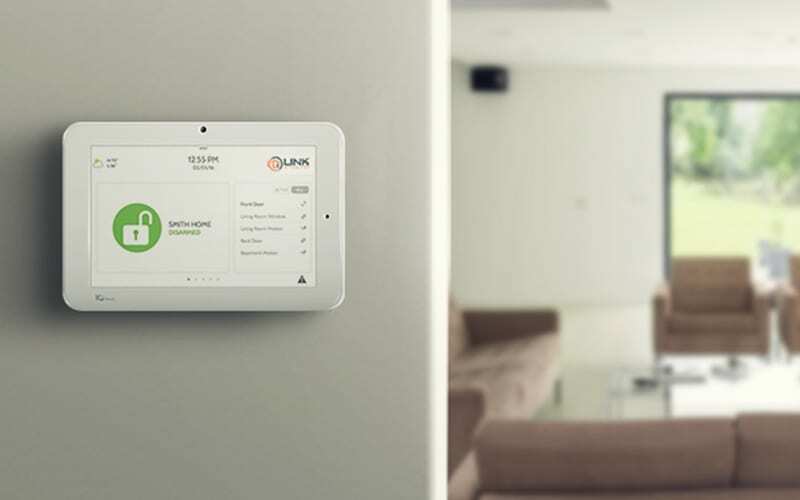 Because the majority of Vivint’s equipment is designed and manufactured exclusively by Vivint, their smart home equipment works well, making it easy to get all your home’s systems working together. You can use your Amazon Echo or Google Home to set your security system, adjust the thermostat, turn the lights on and off, or even lock the front door. Vivint is also a great system for those who are interested in the Nest family of smart devices, including the Nest Cam and Nest learning thermostat. Vivint’s mobile app uses the same user interface as its Sky control panel, which makes it simple to switch between them and easily navigate either one on your Apple or Android devices. While we have seen this aspect of Vivint improve over the years, customers are still complaining that the company is very sales-oriented and will try to push you to purchase additional equipment or lengthen your contract. Vivint’s monitoring is more expensive than other leading security companies. If you live in a rural area where cell service is spotty, you may want to consider a system that offers hard line options, since Vivint works only with a cellular connection. Vivint is a great choice for those who are starting home automation from scratch and want the peace of mind of professional installation and a comprehensive, fully integrated system. If a DIY system is more your style, then Link Interactive might be a good choice—it ranked second on our list of Best DIY Home Security Systems for 2018. Like Vivint, Link offers professional monitoring, but it has shorter contracts. Its Z-Wave compatible technology means you have a large selection of smart devices to choose from, so you can put together an affordable smart home system that works for you. You can mix and match your security system and home automation equipment, so you only get what you need. Because it’s a DIY install, there are no installation fees, and Link Interactive doesn’t charge an activation fee. Contracts are flexible, with a choice of twelve, twenty-four, or thirty-six months, and there is a thirty-day money back guarantee. Monitoring is 24/7 through Alarm.com. Link Interactive has one of the most affordable systems out there, and its transparent pricing makes it easy to know exactly how much you’re going to pay. Many security companies either don’t include video monitoring or charge a hefty fee for it, but Link Interactive offers it as an add-on for just an extra five bucks a month. The market is brimming with Z-Wave capable devices, including everything from thermostats and lights to high-water sensors and clothes dryers. Z-Wave lets you connect a wide variety of devices to your security system, making for a truly smart home that you can control from your phone. Customers tell us that Link Interactive’s customer service representatives are dedicated to resolving customers’ issues with courtesy and promptness, which is a huge plus when it comes to a do-it-yourself system. But it comes with a downside: customer service is only available during regular business hours, not 24/7. Like Vivint, Link Interactive is connected exclusively through cellular technology, so if you live in an area with unreliable reception, it may not be the best option for you. If you’re a little more tech-savvy and you want some freedom with the kinds of devices to include in your smart home, Link Interactive allows you to mix and match with a variety of compatible equipment. It’s a great way to build your ideal system yourself, so you know how each device communicates with the others, and it’s a cheaper alternative to pricier systems. The 24/7 professional monitoring can give you the comfort of knowing your home is fully protected even when you’re not there. If you’d rather avoid contracts and monthly fees altogether, a Samsung SmartThings kit might be a good fit for your smart home automation needs. A starter kit runs around $200 and includes devices for both home security and home automation. 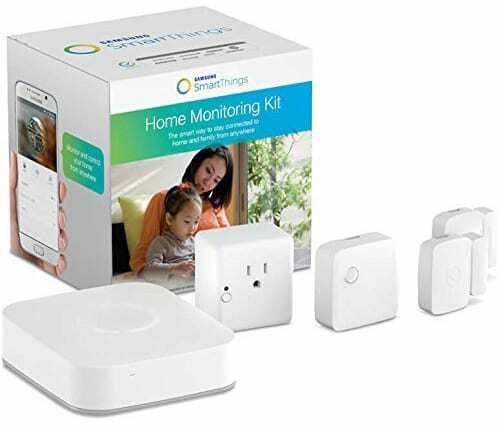 To get started with your smart home security, we recommend buying the SmartThings Home Monitoring Kit. It comes with the hub, which will act as the brain of your system, two door/window sensors, a motion sensor, and a smart outlet. Additional add-ons include cameras, door locks, smoke and carbon monoxide sensors, light switches, and more. Once you get your system set up, you can monitor every integrated device using the SmartThings app on your tablet, iPhone, or Android device. The SmartThings hub works with ZigBee, Z-Wave, IFTTT, and other Wi-Fi enabled devices. 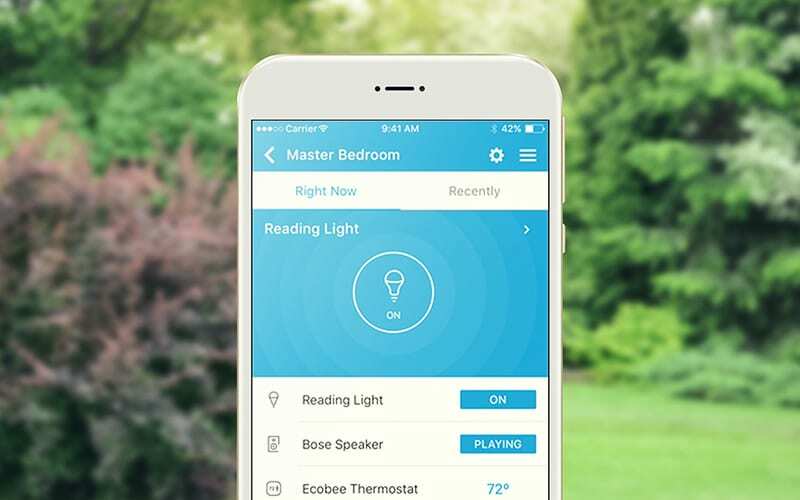 It integrates with Google Home, Ring, Amazon Echo, Honeywell devices, Phillips Hue light bulbs, Kwikset locks, and many more, which means you’ll have a wide range of options when it comes to setting up your home automation. As long as a device is compatible, you can add it to your system, no matter how many you decide to pile on. But keep in mind that with a large number of additional devices, you may need a repeater to improve Wi-Fi connectivity. We really like the key fob sensors offered by SmartThings because they can be programmed to “talk” to your system when they come into range. You can set rules for each sensor, so that the door unlocks and the lights automatically come on when you get home, or you can get push notifications on your phone when your child gets home from school. SmartThings offers an attractive, high-quality product for an affordable price and gives you freedom to add more devices whenever you like without having to worry about having additional monthly fees for monitoring them. SmartThings smart home monitoring is limited to your mobile device—there are no options for monitoring or controlling your system with your computer. If you already use a Nest thermostat or are thinking about buying one, keep in mind that SmartThings is not compatible with Nest products. As smart home technology advances, it can be tricky to keep up with all the gadgets available. Here are a few of our favorite pieces of smart home security equipment. For maximum home security, install both exterior and interior video surveillance. Smart security cameras can automatically start recording when they detect motion, and they can be programmed to send push notifications to your phone so you can watch the live feed. When someone approaches a smart doorbell, the doorbell’s motion sensors will trigger the built-in camera to start recording. When a visitor presses the doorbell, it will alert you through your phone, and you’ll be able to see who’s at your front door and speak with them using a two-way communication feature. Keyless deadbolt locks have keypads that let you unlock your door with a four-digit code and lock it with a press of a button. But you don’t have to use the keypad—your smart phone can act as a remote control so you can lock and unlock the door remotely as well. You can also arm your security system when you press the lock button and disarm the security system when you unlock it. You can set smart lights to turn on and off at different times of day or set rules for when they turn on and off. For example, you can program your lights to automatically turn off when you set your system to “away,” or you can have them turn on automatically when your security system is disarmed. You can also set them to flash if your alarm goes off. How should I start building my smart home security? Start with a hub, but keep in mind that some devices—like the Nest thermostat—can act as a hub for other devices. If you have any specific smart devices you’re interested in, find out which systems they’re compatible with before you buy your hub. Why should I integrate lights into my smart home security? Lighting is one of the best ways to deter criminal activity because no burglar wants to get caught in the spotlight. You can set lights to turn on when motion is detected, or you can set lights to turn on and off at different times when you’re not home to fool burglars into thinking the house is occupied. And a nice bonus: integrating lights into your system can make your home more energy efficient. Because most security systems already use smart home technology, starting with a smart security system is a great way to start your journey to a fully integrated home. Once your home is secured, add on more devices and appliances to make your life easier, like a smart coffeepot or smart dishwasher.